Have I mentioned that my parents live next door? A few years ago, they were able to purchase the house next to ours, but weren't able to move to Arizona until they both retired. That finally happened last spring, and over the summer they transplanted themselves from the midwest to the southwest. It's been great having them so close, and the kids especially have enjoyed having their grandparents across the yard. One of the things that my mom has always loved to do is cook and bake, so she's enjoying the opportunity to do so with the kids. Pillsbury Ready to Bake! Shape cookies are a favorite treat for the kids to bake with Grandma, so I was excited when I saw this opportunity to share a fun gift package centered around these cookies. In fact, when I took the coupon over to my mom's, I found that she already had a couple packages in her refrigerator waiting to bake with the kids! The cookies have fun designs to go along with holidays, and are found in the refrigerated section of the grocery store. They take only 8 - 10 minutes to bake, and you can choose how many to bake from the package if you don't want to bake it all at once. 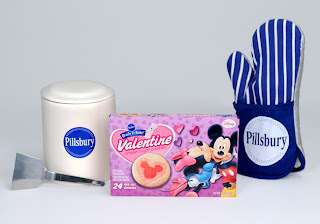 Pillsbury and BlogSpark have provided a $1.10 coupon off your next purchase of Ready to Bake! cookies! Just click here to download and print your coupon. I received the gift pack shown above (well, a coupon for the cookies, not the box of cookies!) and I have another to give away to one of my readers. It includes a VIP coupon for a FREE package of cookies, an oven mitt, a Pillsbury cookie jar and a spatula. Lydia opened the cookie jar immediately and was disappointed that it didn't hold cookies yet when I took it out of the box. Entries for my giveaway are completed on my giveaway form. Take a look at the required questions below, then CLICK HERE to pop over to the giveaway form. Fill in all the information and I will use random.org to choose which entry will win the giveaway. Comments left below will not be included in the giveaway. MANDATORY QUESTION: What's your favorite cookie? The giveaway will end February 14, 2012. Good Luck!